1) Cook the pasta according to the package directions. Reserve 1/4 cup of the cooking water, drain the pasta, and return it to the pot. 2) Meanwhile, heat the oil in a large nonstick skillet over medium-high heat. 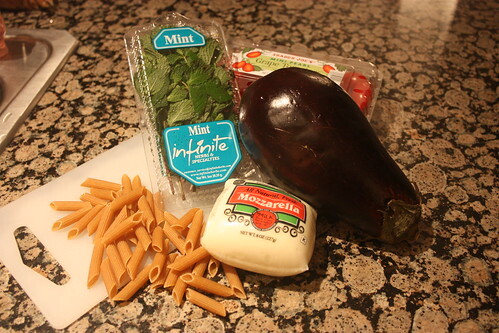 Add the eggplant and cook, tossing occasionally, until golden brown and tender, 8 to 10 minutes. Add the tomatoes, garlic, red pepper, 3/4 teaspoon of salt, and 1/4 teaspoon of pepper and cook, tossing, until the tomatoes soften, 2 to 3 minutes more. 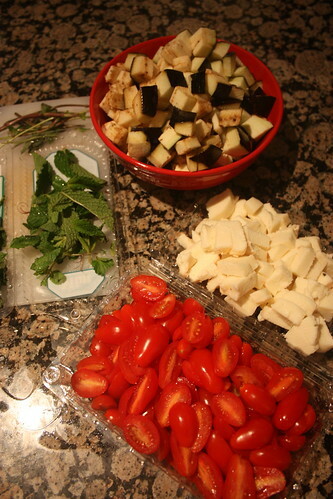 3) Add the tomato mixture to the pasta, along with the mozzarella and reserved cooking water, and toss to combine. Sprinkle with the mint. All in all I thought this was quite tasty. The red pepper gives it a bit of kick (I have chapped lips so I cried a little but it was totally worth it) and the mint has this amazing aftertaste that is unexpected and wonderful. I’ll probably make this again. I’d also like to pretend like it’s pretty healthy so that’s always a plus! 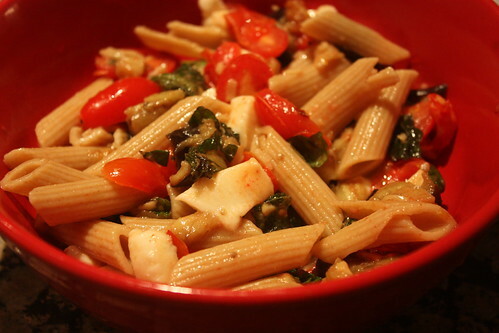 i love pasta so this looks so delish!!! !